By opening an account with us, you will receive significant price discounts, and many other benefits. We serve various buyers, such as Electronics & Computer stores, OEM's, Government institutions, Military, selected retail stores, Educational Institutions, Corporate Nuyers, Cable Installers, and End Users in the USA, Canada, Australia, and other countries throughout the world. 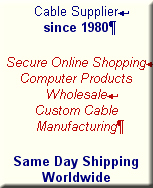 For over 25 years we supplied our customers with Standard and Custom Cable Assemblies, Adapters, Bulk Cable, Connectors, Cable Installation Parts, Computer Parts, Audio Video Cabling Products and Fiber Optics. We are a reliable cable supplier, with excellent customer service, quality products and low prices. Copyright 2005-2016 Hello Cables. All rights reserved.